February 25, 2010 - Beginning Monday, March 1st, All Nippon Airways (ANA) will begin introducing women only lavatories on ANA Group international routes excluding Air Bus 320 and Boeing B737 aircraft. Following numerous requests from passengers for this service, one women-only lavatory will be designated in the aft section of the passenger cabin, location may differ depending on aircraft and configuration and will be available for use by women passengers in all classes of service. 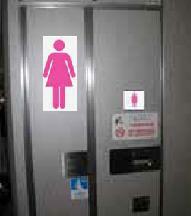 Women only lavatories will be indicated using the signage of a woman on the door of the lavatory. ANA Group continues its efforts to improve service through its program "Inspiration of Japan" by providing their passengers with a highly comfortable flying experience and working to consistently exceed their expectations. In most cases, men will be restricted from using the women only lavatories. However, and depending on flight conditions, men may be allowed to use these facilities in the following situations: When required for safety reasons just prior to the seat belt sign being turned on during take-off and landing. When a passenger is not feeling well and a personal emergency requires such use. When there are very few female passengers and the women-only designation has been lifted for the flight. Passengers are requested to check with a cabin attendant after boarding. All Nippon Airways is the smaller of the two largest airlines in Japan headquartered at the Shiodome City Center in the Shiodome area in Minato, Tokyo, Japan. It operates services to 49 destinations in Japan and 35 international routes and employed 14,179 employees as of May 2009. ANA's main international hubs are at Narita International Airport outside Tokyo and Kansai International Airport in Osaka. Its main domestic hubs are at Tokyo International Airport, Osaka International Airport, Chūbu Centrair International Airport (near Nagoya), and New Chitose Airport (near Sapporo). Introduced in 2009, the "Inspiration of Japan" cabin features included fully-lie-flat-bed business class seats, the first for a Japanese airline. Nearly-enclosed first class suite seats, fixed shell back seats in both of its economy classes, 42-inch pitch in premium economy, which is shared for the largest pitch in its class along with its fellow Star Alliance member Thai Airways International on its Airbus A340-500s. The 34-inch pitch in economy, above average than most airlines, a new AVOD in-flight entertainment system based on Panasonic Avionics Corporation's eX2 technology with iPod connectivity. In-seat shopping and meal ordering, premium cabin touch screen consoles, as well as improvements to its in-flight service. ANA will also introduce a new lounge and check-in concept at Narita for first class and ANA Mileage Club's Diamond Service elite members.